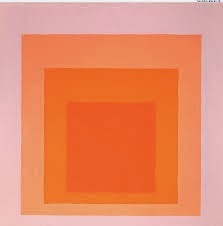 At the next meeting, Wednesday, March 5, I will be giving a mini-workshop on modern color theory based on the book Interaction of Color by Josef Albers. The supplies you’ll need to participate are solid fabrics in the following sizes: large rectangles of various colors (measuring about 4×6 inches) and two small squares (2×2 inches) of the same color. It would be great if you can bring several pairs of small squares. I’ll also bring some extras but you will probably want to work with colors you have on hand.